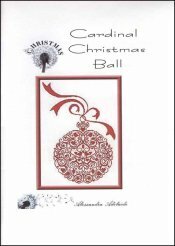 Cardinal Christmas Ball [E1641] - $14.66 : Yarn Tree, Your wholesale source for cross stitch supplies. Cross stitch pattern by Alessandra Adelaide Needleworks. A Christmas ornament all in one color of red with cardinals and hearts. Stitch count 243 x 159.